“As a child I remember seeing how my grandfather would struggle with his dentures. Most of the time he wouldn’t wear them because they were loose and painful when he ate with them. Unfortunately in those days as implants were not available there was no real solution to help him”. 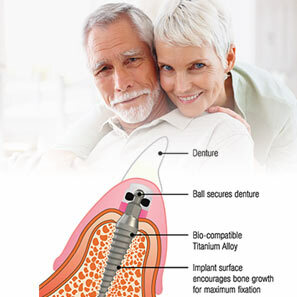 Today there is a simple and cost effective solution to help people with loose and uncomfortable dentures – Mini implants. Denture stability by using mini implants has allowed us to greatly improve the quality of life and confidence of our patients. I placed my first mini implants in 2005 and since then I have seen for myself the long-term benefits it has brought to my patients. 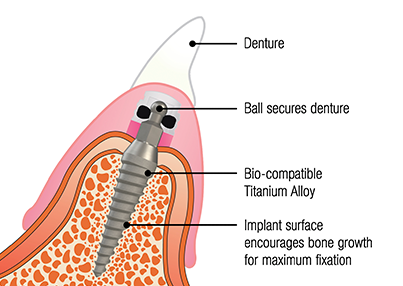 Mini implants allow us to fix and stabilise your dentures so they are no longer loose and uncomfortable. Placing mini implants is very easy and comfortable for the patient. It takes about 30-45 minutes to carry out the procedure and all that is necessary is a simple local anaesthetic. No complicated surgery is necessary and because of the minimally invasive nature of the procedure the healing is quick and generally painless. When will I be able to eat properly? When we place the mini implants, we will also at the same visit insert fixtures into your denture to enable them to be worn immediately. The dentures will now feel comfortable and secure. Within a few days you can eat normally and enjoy your favourite foods. Mini implants offer a cost effective alternative to traditional implants –less than half the overall cost. For a limited period we can offer this treatment that includes 4 mini implants, fixtures, consultation and X rays for £2,000, that’s a £1,000 discount. Support – We will continue to be here for you maintaining your dental health and making sure your implants are well maintained.